To many the start of the new year symbolizes a fresh start and new beginnings. What better time to make the leap towards a better you? As we approach this new year, many of you will be resolving to make changes. Changes to your physical activity, changes to your diet or changes to your weight. In fact, weight loss is the top resolution for the nearly half of Americans who vow to make changes starting in the new year. Sadly, it was found that less than 10% of those who made new year’s resolutions were successful. Instead of making a new years resolution about dieting and weight loss this year, I challenge you to do something a bit different. If you desire a change in your eating habits or weight, resolve instead to learn the practice of mindful eating. After all, we know that the majority of diets fail. They may work in the short term but rarely are they successful in the long run. Why set yourself up for disappointment? By resolving to learn how to eat mindfully, you are resolving to learn a life skill that has staying power: a skill that studies show positively impacts eating and health. Mindful eating is based on the Buddhist concept of mindfulness, or being aware and present of your surroundings at each and every moment. In its most basic sense, mindful eating is about gaining awareness of your food, your body and your appetite. It’s about learning to trust your appetite and intrinsic ability to regulate food intake rather than relying on extrinsic factors, such as fad diets with restrictive and complicated rules. It’s about recognizing hunger: true physical hunger rather than emotional hunger. It’s about gaining awareness to whether you are eating to nourish your body or to stave off boredom, loneliness, or other emotions. It’s about focusing your attention on your food rather than being distracted by TV, work or social media. It’s about learning to feed your body what it needs, when it needs it. It’s also about being okay with eating food for pleasure and learning that no food should be out of bounds. Mindful eating is nonjudgmental. And most of all it’s about learning to enjoy and appreciate food and the body in which it nourishes. Mindful eating can benefit everyone. You don’t necessarily need to have issues with food or weight to benefit from gaining a deeper awareness of your appetite and food intake. However, studies do show that mindfulness techniques can be particularly beneficial to those struggling with weight issues, binge eating, disordered eating, or diabetic control. Could you be mindlessly eating and unaware of it. Do you grab a mid-morning pastry and coffee to take a break from stressful work, rather than out of real hunger? Are you snacking after dinner due to boredom? Does your mind register the full sensations of your snack while your attention is engaged in TV ? Is that extra big portion of cake because you had an absolutely terrible day? If any of these situations sound familiar, then mindful eating may be for you. Mindful eating can help you gain control of your food intake. There are no expectations on what you should be eating, as there are with diets, only that you start paying attention to what you are eating and how it makes you feel. Increasing mindfulness can assist you to gain a deeper understanding of your eating patterns which, in turn, can lead to positive and healthful dietary changes. How Can I Start Learning Mindful Eating? Below are several suggestions on how to get started on your mindful eating journey. It can be helpful to keep a journal of your experiences with these, and any other, mindful eating practice. Remember that any new skill takes time to develop. Taking small sustainable steps is better than taking a giant leap when it comes to making personal change. Take one of these suggestions and work on it until you feel comfortable with it. Then move onto the next mindful eating challenge. Please remember, mindful eating is a nonjudgmental practice. It’s about discovering your true hunger and learning to enjoy food. There should be no shame, guilt or any other negative emotions while practicing these mindful eating exercises. Too many times we eat while distracted. These distractions can come in many forms: eating in front of the TV, while fiddling with a smartphone, engrossed in a book or while in transit. For some people, eating while distracted can lead to eating more food and an inability to recall what has been eaten (often leading to higher intake later in the day). Essentially, there can be a number of external factors that get in between our ability to enjoy food and recognize hunger and fullness cues. This is why one of the first steps of learning to eat mindfully is limiting distractions. So how can you eat without distraction? The simplest way is to make an effort to sit down and eat without any external factors. No TV, no phone, no video games, no computer, no work. Nada. Try it a couple of times and see what you notice. Do you notice any differences in how you feel, how your food tastes or how much you eat? One study found that limiting distractions does indeed reduce unnecessary snacking later in the day. Perhaps shutting off the distractions will have a positive impact on your eating, too. Keep in mind that eating without external distractions is not a reason to scarf down your meal in a few minutes. Challenge yourself to sit down for at least 20 minutes and eat without distractions. Set a timer if you need to. This may help pace your meals and give you sufficient time to take notice of your eating experience. Learning to eat mindfully means learning to really taste, smell, feel and hear your food. After practicing eating without distraction, you’ll be able to use your senses to get to know your food. This may require you to slow down while you are eating. Take small bites and conscious chews. What are you experiencing when you eat? How does your food taste? Are your bites savory or sweet? Salty or sour? How does your food smell? Do the aromas remind you of anything? Do they cause your mouth to water? How does your food feel in your mouth? Creamy or textured? Warm or cold? Does your food make a sound when you cut or chew it? Does it crunch? How does your body feel while you are eating? How about after you’re done? Does your stomach feel satisfied, too full, or aching for more? Are there foods that make your body feel great while others not so much? Do you notice if the first bite of food tastes as delicious as the last? Is there a point during your meal where the food loses its allure? Take note of all your experiences while eating. These can provide much needed insight into whether you are nourishing your body with the food it needs and enjoys. If you are feeling up to the challenge, find some time to do this senses-related mindfulness activity. This great little exercise involves taking a single raisin (or a square of chocolate, if you like) and exploring it with your senses. Seeing it, touching it, smelling it, tasting it, and consuming it. I can assure you that this will be the most time and attention you have ever taken to eat a single raisin (or chocolate square). It can be an enlightening experience into just how many sensations a single morsel of food can give us. Do you know your hunger? I mean, really, know your hunger? After years of dieting, many people have lost grip with their hunger. Following weight loss diets causes you to ignore your hunger cues. Diets require following external guidelines rather than listening to internal cues. Learning to recognize your hunger and fullness cues is a very important aspect of mindful eating. Once able to recognize and identify your hunger level, you can better regulate your intake to what is appropriate for your body. Using a tool like a Hunger Meter can be useful in helping you decide whether it’s appropriate for you to have a snack midday or to decide whether you feel like a light or heavy meal. This tool rates hunger on a scale of 1-10, with 1 being unpleasantly, almost sick hungry and 10 being absolutely uncomfortably stuffed. A rating of 5 means totally satisfied (neither hungry nor full), and this is where one should probably stop eating. Eating past this point starts to feel uncomfortable. Starting a meal or snack at a rating of 3 or 4 is appropriate, as you’re hungry but the hunger has not yet caused negative effects on your body. Letting your hunger rating get any lower than this before eating is not advised. This can lead to overindulging or bingeing to compensate for the extreme hunger the body is feeling. Try referring to this Hunger Meter during meals and snacks to help you recognize when it may be appropriate for you to push your plate aside, or to see if it’s appropriate to have a second helping. Remember, it takes about 20 minutes for your brain to get the signal that your stomach is satisfied so if you’ve eaten rather quickly, it’s best to wait a little bit to rate your hunger and fullness. Take time to journal about your experience with rating your hunger before, during, and after meals. Reflecting upon this journaling can be a helpful way to learn about why you eat (is it hunger? emotions?). Do you notice any patterns? Are you frequently being left over or under satisfied at meals? Do you eat when you’re not hungry? Can you recognize when you have had enough? This exercise aims to shed a little light into the reasons, other than hunger, that may cause us to eat. Often times, we turn to eating when our emotions get too much to deal with. To gain a little insight into this, make or print off a list of emotions and feelings. You can find such a list online by doing a simple search of “list of feelings” (i.e. here). When you have your list ready, take time before each meal or snack to make a check mark in front of any emotions you are feeling. When eating is complete, make a check mark after any of the emotions you are feeling. After a few days, take a look at your list. Are there any emotions that get ticked off more than others? Are some emotions more prevalent before or after eating? Are there any indications that you are eating because of things other than hunger? If so, then these emotions may need to be dealt with in another, more healthful way. If you are unable to deal with these emotions on your own, consider contacting a therapist to help you make sense of what you have discovered. These exercises will ideally bring a little insight into whether or not you have been mindlessly munching away all these years. If you want to explore mindful eating more deeply, there are many wonderful Registered Dietitians and Therapists with mindful eating experience that can assist you. Hopefully, by now you have learned that mindful eating is about discovery. 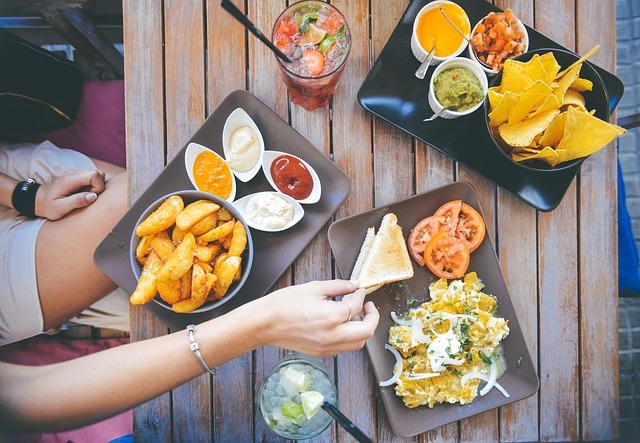 Discovering what may be hindering you from having a healthier relationship with food. Discovering a love for food and treating your body right. And discovering how to best nourish your body. Mindful eating may be able to give you what years of trying fad diets could never provide. Why not try something else this New Year's and resolve to do something different. Ditch the diet resolutions for good and embrace something more mindful.